The range of the eastern heather vole includes much of Canada, and extreme northeastern Minnesota. Minnesota represents the southern edge of this species' range. Though fairly widespread, the heather vole is most likely limited to small, semi-isolated populations. The first documentation of a heather vole in Minnesota was in Lake County in 1940, when a single specimen was identified. Since then, less than 20 individuals have been found in St. Louis, Lake, and Cook counties. Because of the small number of locations that have been found despite targeted surveys, the heather vole has been classified as a species of special concern. The heather vole is a small, short tailed rodent with a total length of 135-155 mm (5.3-6.1 in. ), and a weight of 30-45 g (1.1-1.6 oz.). The species resembles other voles (Microtus spp.) and bog lemmings (Synamtomys spp.). It has fur that is brown on the back, usually more yellowish or tan than other voles or lemmings, and white or gray underneath. Heather vole's feet are white or pale gray (McAllister and Hoffman 1988; George 1999). Their tail is bicolor and shorter than that of other vole species, but longer than that of bog lemmings. Heather voles are best distinguished from other species by their teeth. Unlike other species, the inner reentrant angles on the lower molars are much deeper than the outside angles (George 1999). Additionally, the upper incisors lack deep grooves that are present in bog lemmings. Throughout its range, the heather vole may inhabit coniferous forests with a heath understory, wet meadows, rocky hillsides, forest edge, or deciduous shrubby habitats (George 1999). Proximity to water, boulders, coarse woody debris, and plants of the Ericaceous family are important to its survival (U.S. Forest Service 2000). In Minnesota, one heather vole was trapped in a poorly drained black spruce and balsam fir woodland with groundcover of mosses, ferns, horsetail (Equisetum spp.) and ground pine (Lycopodium spp.) (Etnier 1989). Other Minnesota specimens have been documented in the following habitats: 1) a boulder field with a black spruce (Picea mariana) and balsam fir (Abies balsamea) overstory and a groundcover of lichens, ferns, and mosses; 2) a clearcut with boulders covered in lichens, ferns, and mosses (Jannett and Oehlenschlager 1997); and 3) a large, semi-open black spruce sphagnum bog. 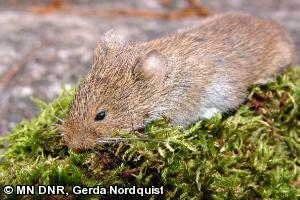 Heather voles reside in Minnesota year round and do not hibernate. Winter nests and subnivian tunnels are constructed at the ground surface (McAllister and Hoffman 1988). During the summer this species constructs short burrows and nests underground. Nests are made of grass, leaves, and lichens. Except for a brief period during the breeding season, heather voles live solitary lives (George 1999). The breeding season occurs from May through August, and females may produce up to 4 litters per year (McAllister and Hoffman 1988). Gestation lasts approximately 3 weeks, after which 2-8 young are born (George 1999). The female takes care of the young, and has a territory that she defends from other voles. The young are weaned after 3 weeks and will reach adult size after about 100 days. Females are sexually mature at 4-6 weeks of age but will produce small litters in their first year. Males will not breed until after their first winter (McAllister and Hoffman 1988; George 1999). Heather voles are herbivorous and common food items include berries, leaves, seeds, lichens, fungus, and the bark of shrubs (McAllister and Hoffman 1988; George 1999). Food is gathered and cached at burrow entrances during the evening and night when the voles are most active and consumed during the day in the safety of the burrow (George 1999; McAllister and Hoffman 1988). Predators of this species include martens (Martes americana), long-tailed weasels (Mustela frenata), ermines (Mustela erminea), hawks, and owls (McAllister and Hoffman 1988). Heather voles are difficult to trap, and leave virtually no sign of their presence. The meadow vole (Microtus pennsylvanicus) will out compete heather voles where their ranges overlap. Consequently, grassy habitat, which is preferred by meadow voles, should not be allowed to impinge on heather vole habitat (U.S. Forest Service 2000). The Minnesota Biological Survey targeted this species in 2003. Despite intense trapping activities, they were only able to locate two individuals. More research is needed to determine the extent of heather vole distribution in Minnesota and the ecological requirements necessary to ensure a viable population (U.S. Forest Service 2000). Etnier, D. A. 1989. Small mammals of the Boundary Waters Canoe Area, with a second Minnesota record for the Heather Vole, Phenacomys intermedius. The Canadian Field-Naturalist 103(3):353-357. George, S. B. 1999. Eastern Heather Vole (Phenacomys ungava). Pages 618-619 in D. E. Wilson and S. Ruff, editors. The Smithsonian book of North American mammals. Smithsonian Institution Press in association with the American Society of Mammalogists, Washington. Jannett, F. J., Jr., and R. J. Oehlenschlager. 1997. Range extension and unusual occurrences of the Heather Vole, Phenacomys intermedius, in Minnesota. The Canadian Field-Naturalist 111(3):459-461. McAllister, J. A., and R. S. Hoffman. 1988. Phenacomys intermedius. Mammalian Species 305:1-8. U.S. Forest Service. 2000. Population viability assessment in forest plan revision. Questions for animal population viability assessment panel: Phenacomys ungava. United States Forest Service, Region 9, Duluth, Minnesota.